A large Industrial manufacturing facility found that their steel pipe manufacturing was creating an undesirable accumulation of heavy metals dust throughout the entire plant. Not only was this a potential health risk to the plant workers, there was a structural and safety problem because the dust could spark and cause a fire or explosion. The plant operation was housed in a 60,000 square foot – 38’ high building with a dizzying array of ductwork, high voltage electric trays and overhead crane rails. The client gave us a limited window to complete the dust-removal work and get them back up and running. Working with the clients Environmental Health & Safety department and engineering staff, Enviro-Vac developed a suitable plan to meet the necessary schedule, safely, on time and on budget. Enviro-Vac installed an industrial, 40,000 CFM diesel powered, dust collector to place the plant under a negative pressure and utilized 3-large HEPA filtered, diesel vacuum loaders with numerous splitter attachments allowing multiple workers, working from scissor lifts & booms using a 26-man crew for double 12-hour shifts over two weekends to complete all the cleaning work from all surfaces within the plant. A safer working environment with better lighting led to increased production and happier workers. Tons of heavy metal dust and blasting grit was gone. 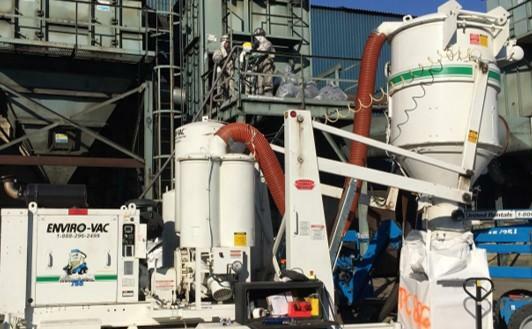 Enviro-Vac's use of HEPA vacuum loaders for decontamination of facilities and plants has been a trademark of the company since 1976 and the removal of contaminated blast media, extraction by vacuum, industrial cleaning of dust collectors and bag-houses, hazardous waste remediation and other services for hazardous and non-hazardous material handling are well documented.